This directory is arranged in alphabetical order. 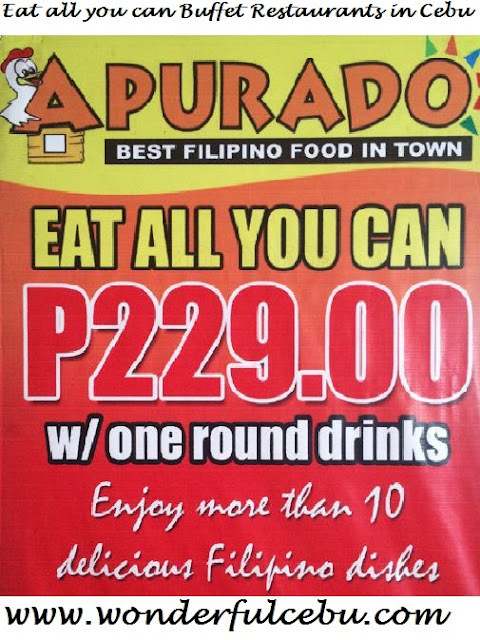 Apurado Chicken Haus is located at Don Jose Avila Street, Capitol Site, Cebu City. It is very near the provincial capitol and Cebu Doctors' University Hospital. They serve daily eat all you can in Cebu. The buffet meals are available between 10 a.m. to 2 p.m. and 5 p.m. to 9 p.m. Per person costs start at PHP 229 without lechon or PHP 269 with lechon. Call +63 32 512 4858 or +63 32 516 0732 for reservations. Located in N. Escario Street near Golden Peak Hotel in barangay Kamputhaw, Cebu City, this Korean joint serves unlimited samgyeupsal at only PhP 299 per person. Buzz them at +63 32 518 5445 or +63 927 925 0308. Buffet 101 is one of the biggest restaurants that offer eat all you can in Cebu. This huge restaurant is now open at City Times Square Phase 2, 168 Mantawi International Drive, barangay Tipolo, Mandaue City. They have diverse array of international cuisine to choose from. For reservations and queries, punch in +63 32 517 2222, +63 32 349 2710, and +63 32 564 9999. The Burrow Lounge is located at the ground floor of Tsai Hotels and Residences, Wilson Street, Lahug, Cebu City. 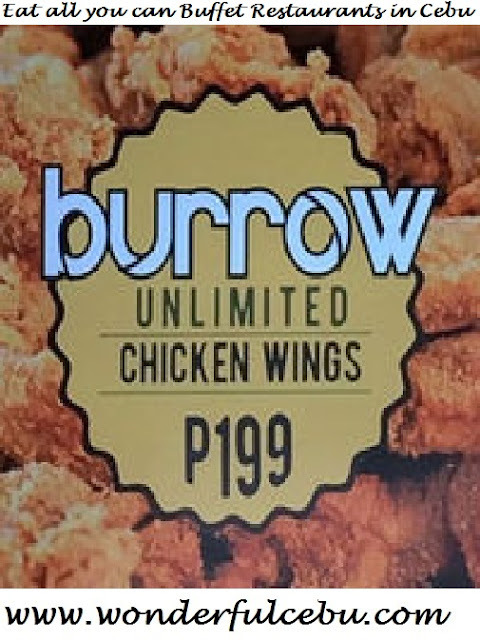 Try their Unlimited Chicken Wings with unlimited rice for only PHP 199. Add PHP 30 for iced tea. Available from 5-9 p.m. only. You may call then at +63 32 406 0731. Eat all you can breakfast, lunch, and dinner buffet is available at Cafe Breeze. It is managed by Red Carpet Catering Services. Cafe Breeze is located at the Bayfront Hotel Cebu. The hotel is located near SM City Cebu at the North Reclamation Area. Promo price is at PHP 299 per person. Call +63 32 230 6777 for inquiries and reservations. Cafe Dulce serves eat all you can pulutan buffet for only PHP 199 per person every Tuesdays and Fridays starting at 7:00 p.m. to 10:00 p.m. You will also be entertained with dance presentations. Cafe Dulce is located at the Matcan Town Center, Quezon National Highway, Pajo, Lapulapu City. For reservations, call +63 32 495 2741. Cafe Eloisa at Eloisa Royal Suites along Maximo V. Patalinghug Avenue in Lapulapu City has regular promos for eat all you can in Cebu. They usually have dinner buffet promotions. Get in touch with them at +63 32 492 1913 or +63 917 309 1921. Located in Nivel Hills in uptown Cebu City, Marco Polo Plaza Hotel's Cafe Marco serves daily eat all you can in Cebu. Cost for buffet meals start at PHP 1,395 per person. For inquiries and reservations, call +63 32 253 1111. Cafe Sarree serves buffet breakfast for guests of Escario Central Hotel. They are located at the Escario Central Mall. The cafe is open daily between 7 a.m. and 10 p.m. You may dial is +63 32 254 5992 for reservations and inquiries. Cafe Uno serves eat all you can buffet meals for lunch and dinner every Monday and Wednesday. It is located inside Waterfront Cebu City Hotel in Lahug, Cebu City. Cost is PHP 600 per person on Wednesdays. For inquiries and reservations, call +63 32 232 6888 local 8605. PhP 199 Friday dinner buffet is available at Canberry Hotel at V. Rama Avenue, Guadalupe, Cebu City. It is beside the old PRC. For reservations and inquiries, ring them at +63 32 239 7888 or fax at +63 32 401 2585. You may also visit the Canberry Hotel website. Casa Rosario at Ramon Aboitiz Street, Cebu City offers eat all you can buffet breakfast. Cost is PHP 150 per person from 7:00 to 11:00 a.m. Call them at +63 32 253 5134. A new restaurant that offers eat all you can in Cebu is the Chik Chow Buffet near the University of San Carlos North Campus along General Maxilom Avenue in Cebu City. Lunch buffet is from 11 a.m. to 3 p.m. and dinner buffet is from 6 p.m. to 10 p.m. Cost starts at PhP 288 per person. For reservations, dial +63 32 255 9959. They may also be reached through mobile numbers +63 927 467 1733 (Globe) and +63 923 401 9402 (Sun Cellular). Their exact street address is 316-C Mango Avenue (or General Maxilom Avenue), Cebu City. 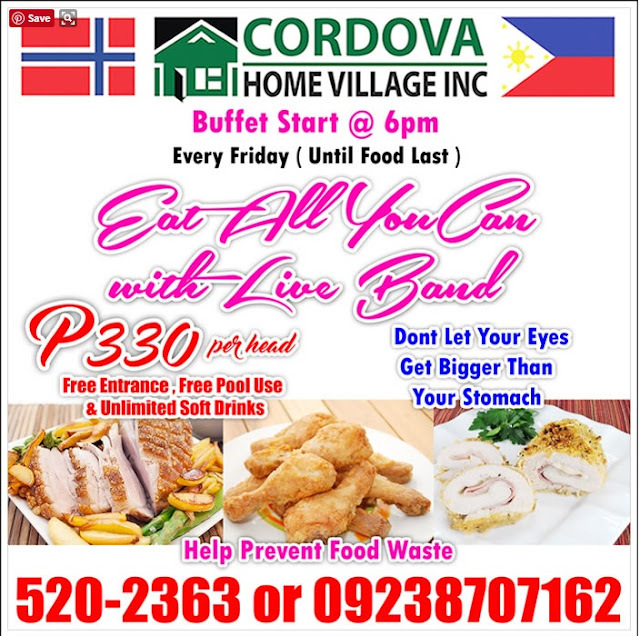 It's eat all you can Fridays (7:00 to 10:00 p.m.) and Barbecue Madness buffet Saturdays (5:00 to 8:00 p.m.) at Cordova Home Village in Sitio Datag, Catarman, Cordova. Both priced at PHP 320 per person, the fee covers free entrance to the resort, free pool use, and one round of soft drinks or beer (San Miguel Pilsen or San Miguel Light). Call Suzeth, Jane or Mavys for your reservations at telephone number +63 32 520 2363 or mobile number +63 923 870 7162. You may also visit the Cordova Home Village events page. Get unlimited pasta with soup and bread basket at Summit Circle's C2 Classic Cuisine for only PHP 249. They also offer unlimited soup and salad at PHP 199. Dial +63 32 239 3000 to reserve. Summit Circle is located near the Fuente Osmeña Circle in Cebu City. A Chinese-inspired eat all you can dim sum buffet is served at Ding Qua Qua Chinese Restaurant in JY Square Mall in Lahug, Cebu City. Cost is PHP 228 per person without the drinks. For inquiries and reservations, call +63 32 231 0111. 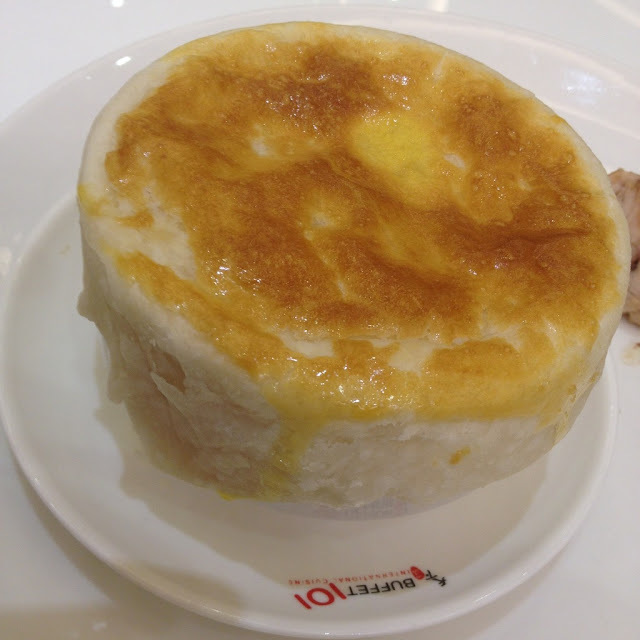 Recommended for dim sum lovers. Although the food in the buffet sometimes tastes different from the ones ordered a la carte. Visit the Ding Qua Qua Facebook page. From Mondays to Fridays, eat all you can business lunch is served at Casino Espanol de Cebu's El Comedor. Enter +63 32 253 1260 local 702 on your dial for reservations. El Comedor is located at F. Ranudo Street, Cebu City. Family Choice Restaurant serves eat all you can in Cebu. They have lunch and dinner buffet meals. It is located at Gaisano Country Mall along Governor M. Cuenco Road, Banilad, Cebu City. Feria is located in Radisoon Blu Hotel beside SM City Cebu at the North Reclamation Area in Cebu City. They serve eat all you can dinner buffet every Tuesday, Thursday, and Saturday. Price is PHP 700 per person. For reservations, one may call +63 32 402 9900. Garden Cafe at Marriott Hotel in Cebu Business Park, Cebu City offers an eat all you can in Cebu. They have a seafood buffet for PHP 1600 every Friday. They have to die for scallops. For reservations, call +63 32 411 5800. 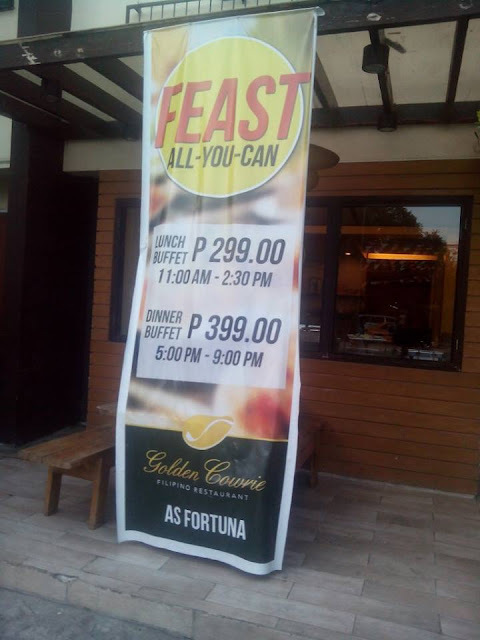 Golden Cowrie Filipino Restaurant along A.S. Fortuna Street in Bakilid, Mandaue City offers a feast-all-you-can buffet for PHP 299 during lunch (11:00 a.m. to 2:00 p.m.) and PHP 399 during dinner (5:00 to 9:00 p.m.). The price already includes bottomless iced tea. 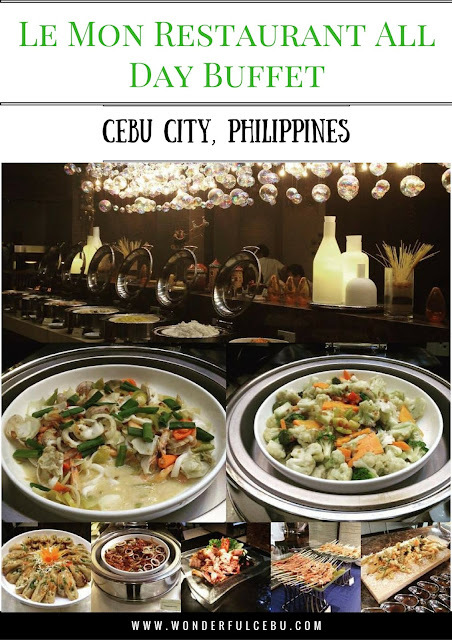 A popular place for eat all you can in Cebu is Grand Majestic Restaurant at the Grand Convention Center of Cebu. It is along Archbishop Reyes Avenue in Cebu City. It is a stone's throw away from Cebu Business Park and Asiatown IT Park. Call +63 32 260 8000 for reservations. Harold's Hotel's themed eat all you can dinner buffet is priced at PHP 428 per person with limitless iced tea. On Tuesdays, the theme is Spiced-Up Taste of Asia. BBQ Nights are on Wednesdays and Fridays. Thursdays are for Mongolian Grill dinners. And Saturdays are Carvery and Pasta Nights. They also have a 4+1 promo. H-Cafe's Buffet Lunch is priced at PHP 388 per person with limitless iced tea while they also offer a 10+1 promo. Harold's Hotel is along Gorordo Avenue in Kamputhaw, Cebu City. Call +63 32 505 7777 for inquiries and reservations. Eat all you can Breakfast buffet is served at Halo Restaurant of St. Mark Hotel along Queens Road, Kamputhaw, Cebu City. St. Mark Hotel is beside the Redemptorist Church. Cost is pegged at PHP 380 per person. Call +63 32 505 5555 for reservations and inquiries. Hotel Elizabeth Cebu along Archbishop Reyes Avenue in Barangay Kamputhaw, Cebu City, has regular eat all you can dinner buffet promos. 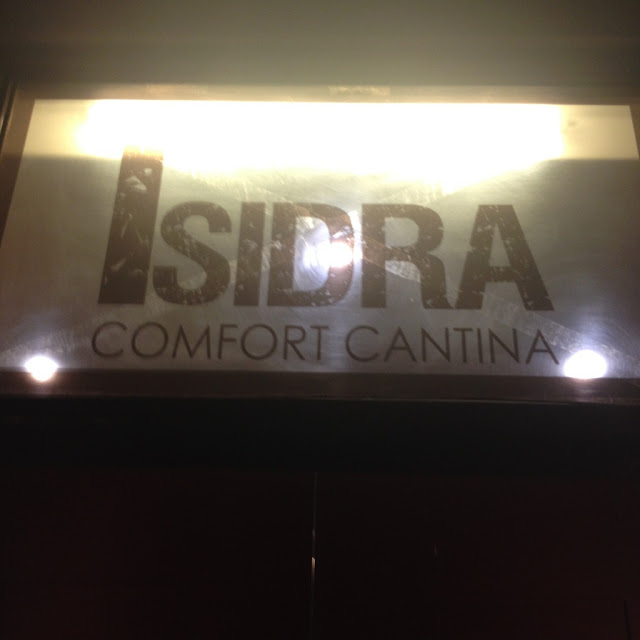 Isidra's Comfort Cantina is an Asian fusion diner. The diner is located at the ground floor of Oftana Building at Jasmin Street corner Don Mariano Cui Street, Capitol Site, Cebu City. They serve a daily eat all you can lunch buffet at PHP 149, drinks not included. For reservations, call +63 32 263 1101. Along A.S. Fortuna Street in Banilad, Mandaue City is the Izakaya Kagura Japanese Restaurant. They offer an eat all you can lunch buffet at PhP 350. Izakaya Kagura Japanese Restaurant is located right beside AA BBQ. Across the University of Southern Philippines Foundation and beside STI College in Salinas Drive in Lahug, Cebu City is Juan Lechonero, a grill that serves eat all you can buffet lunch and dinner meals for as low as PHP 199 every Saturday and Sunday. For reservations, call +63 32 234 1818 or +63 32 233 1818. 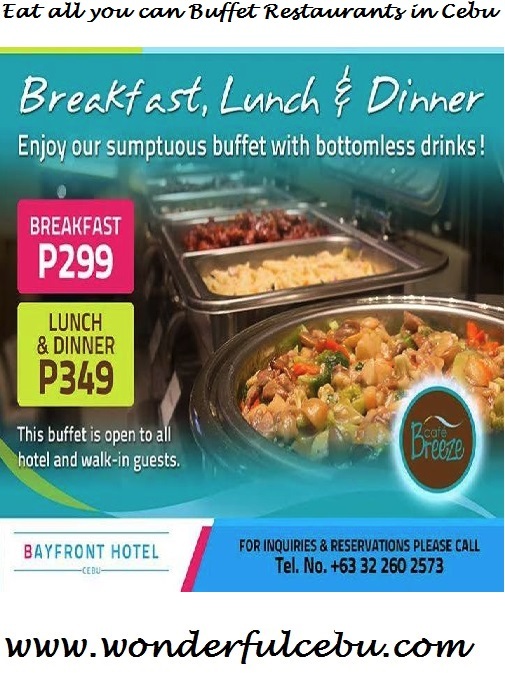 Along Escario Street in Cebu City, Kai at Best Western Lex Cebu Hotel offers eat all you can buffet breakfast on Sundays (6:00 a.m. to 11:00 a.m.) priced at PHP 475 per person. To reserve, dial +63 32 416 5511. 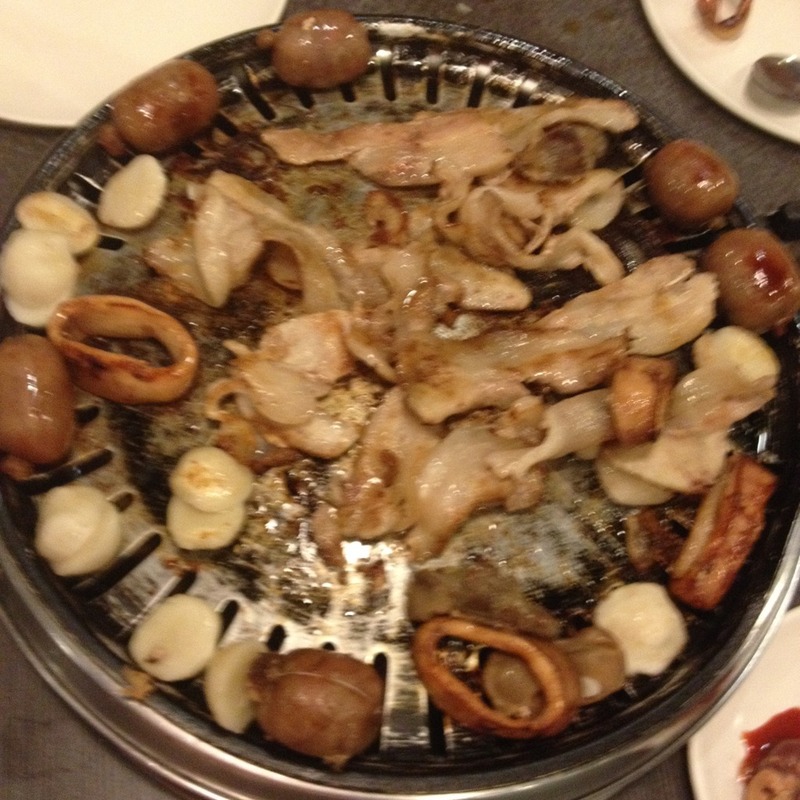 For barbecue lovers, Kan-anan serves eat all you can barbecue buffet on Fridays and Saturdays, from 4 p.m. to 12 midnight. It is located at the 4th floor of Cebu Parklane International Hotel along Escario Street in Cebu City. It is nearby Ayala Center Cebu. Cost is PHP 350 per person. Call +63 32 234 7000 for reservations. Manila's number 1 shabu-shabu restaurant is now in Cebu and they offer an eat all you can buffet for PHP 499 per person. I had fun with the seafood available here. KingOne Rotary Hotpot is located at the 2nd floor of the City Times Square along Mantawe Avenue at the North Reclamation Area, Barangay Tipolo, Mandaue City. Contact numbers are +63 32 505 9786 and +63 32 505 9748. Grill all you want and eat all you can at Kogi-Q at Parkmall in Tipolo, Mandaue Cityfrom 11 a.m. to 2 p.m. and 5:30 to 10 p.m. For PhP 270, you get unlimited samgyeopsal, native chorizo, mussels, hotdogs, squid rolls, chicken liver, chicken, squid balls, squid, eggplant, rice, and unlimited iced tea. Add PhP 100 for unlimited shrimp and beef. For reservations, dial +63 32 405 6010. They have also recently opened branches at SM City Cebu and SM Seaside City. Kublai Khan Mongolian Restaurant offers a Mongolian-style eat all you can buffet wherein you a fill your bowl with whatever you wish on the menu. Those bowls are surprisingly filling. I could hardly finish 2 bowls despite my huge appetite. 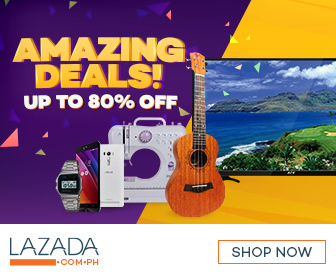 Branches are located at Ayala Center Cebu, Robinson's Cybergate, Parkmall, Gaisano Country Mall, and SM City Cebu. Weekend buffet meals are available at La Terraza inside Casino Espanol de Cebu. Lunch buffet is available on Sundays while dinner buffet is available on Fridays, Saturdays, and Sundays. +63 32 253 1260 local 704 for reservations and inquiries. Also called La Terraza, a restaurant at Pacific Cebu Resort in Lapulapu City also serves buffet breakfast and lunch. For more information, one may visit the Pacific Cebu Resort website or dial +63 32 495 6601 or +63 32 495 6608. Want a cultural show performance while dining? Head over to Lakwatsa Resto Lounge at the 5th floor, ENGY Tech Building, Hernan Cortes Street, Mandaue City. Lunch is at PHP 149 per person and dinner is at PHP 249 per person. For inquiries and reservations, dial +63 32 346 2926 or +63 32 318 0066. You may also text or call +63 917 719 6993. Lipay Mongolian Barbecue is located in Bagumbayan 2, Maribago, Lapulapu City. For a minimum of 30 persons, groups can avail of buffet-style lunch and dinner beach party arrangements with Lowaii Cebu Marine Beach Resort in Suba, Basbas, Lapulapu City. Cost of buffet lunch is pegged at PHP 450 while buffet dinner will cost PHP 550 per person. An eat all you can shabu-shabu place is located at the TAA Center, F. Cabahug Street, Kasambagan, Cebu City. They are open from 11:00 a.m. to 10:00 p.m. and may be reached through telephone number +63 32 231 5136. 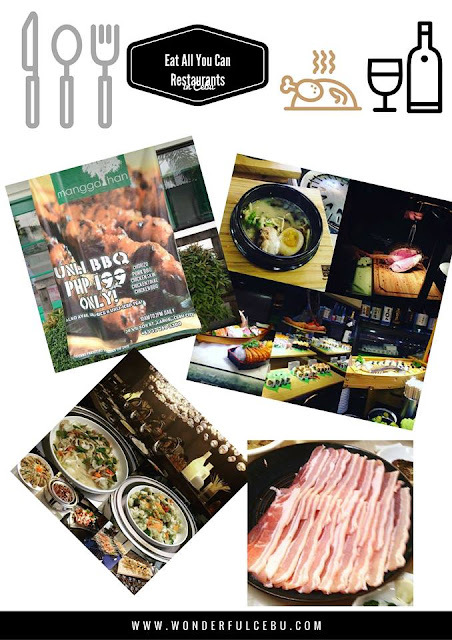 You may also visit the Lucky Bowl Taiwan Shabu-shabu Facebook page. 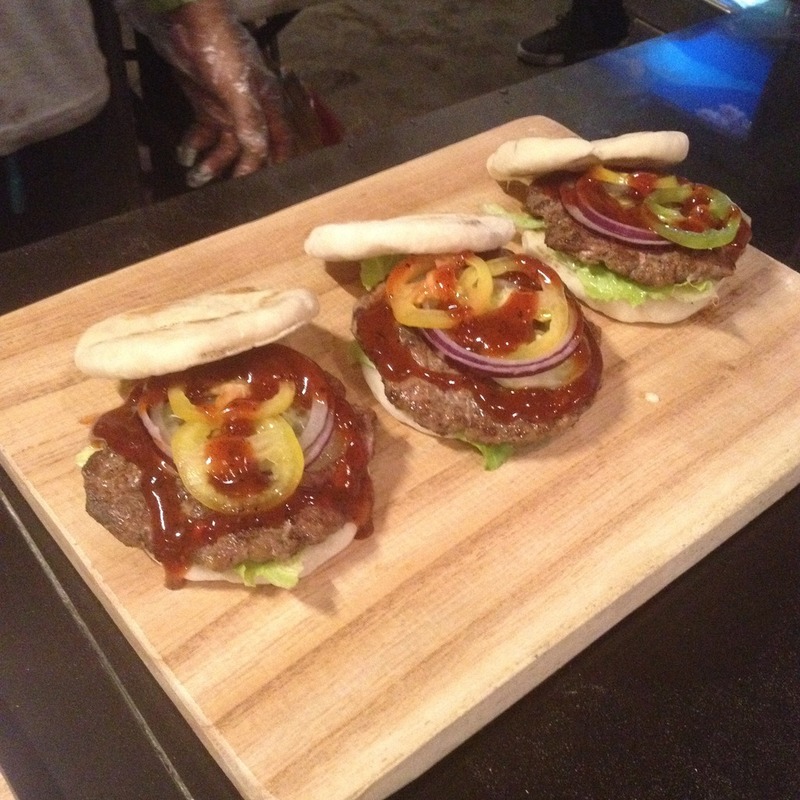 Manggahan now serves eat all you can barbecue from 10:00 a.m. to 2:00 p.m. daily at only PhP 199. Manggahan is at 30 Wilson Sreet, Lahug, Cebu City. 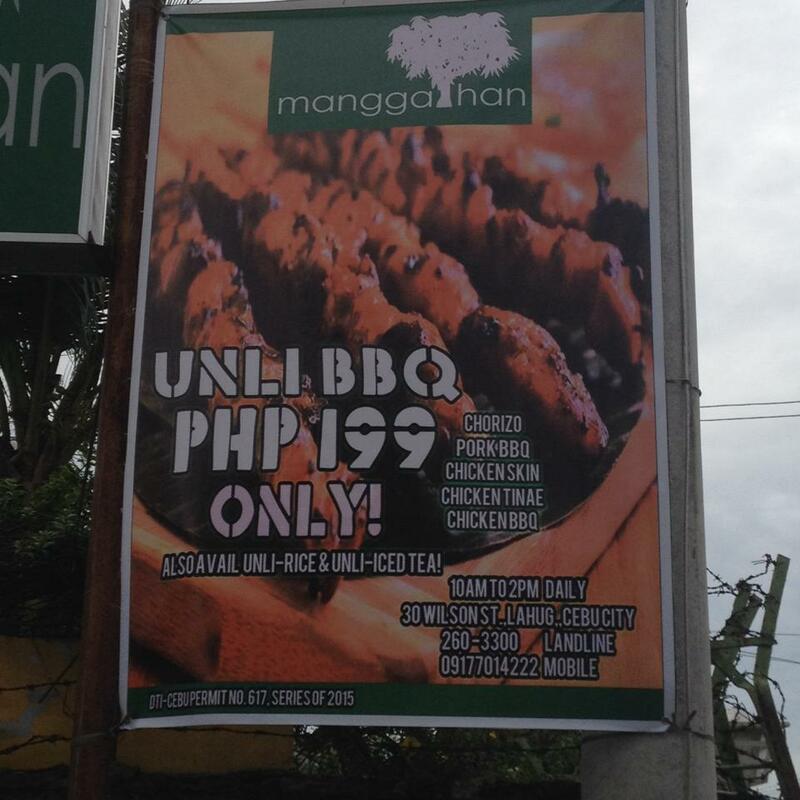 For table reservations for Manggahan's unlimited BBQ, call +63 32 260 3300. Manuel's Restaurant is located at the Cebu Parklane International Hotel along Escario Street in Cebu City. They serve eat all you can meals for breakfast (6:00 a.m. to 10:00 a.m.), lunch (11:30 a.m. to 2:00 p.m.) and dinner (6:00 to 10:00 p.m.). Price is pegged at PHP 650 per person. For reservations, call +63 32 234 7000 or +63 32 411 7000. Miga Korean Restaurant is located along Salinas Drive in Lahug, Cebu City across the University of Southern Philippines Foundation campus. 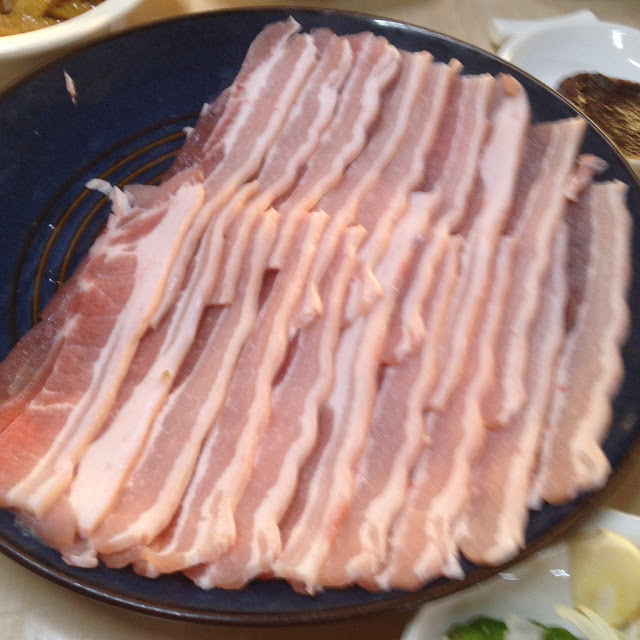 For as low as PHP 300 per person, you will cook your own Samgyeopsal with an unlimited meat supply to go along with other Korean, Chinese, and Filipino dishes on the eat all you can buffet table. 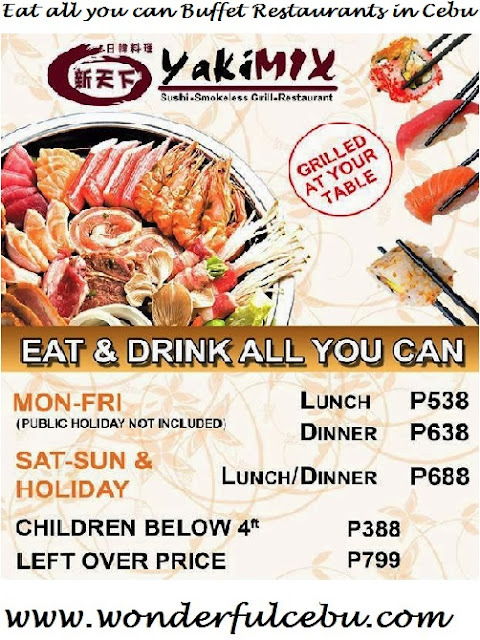 Mikado Japanese Restaurant offers eat all you can in Cebu starting at PHP 380 (lunch) and PHP 480 (dinner). 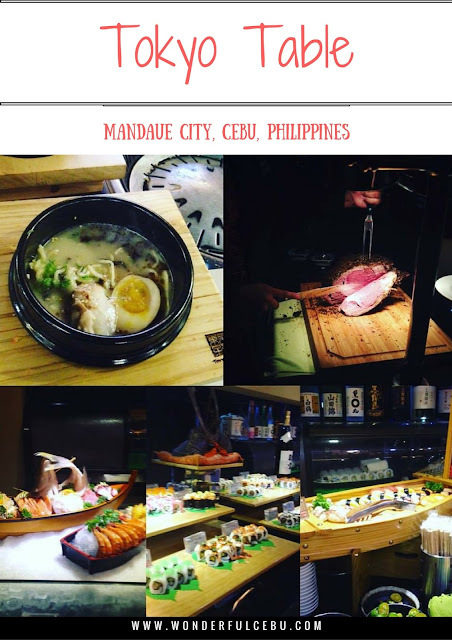 Mikado is located along Archbishop Reyes Avenue near the vicinity of The Grand Convention Center of Cebu and Cebu Parklane International Hotel. Dial +63 32 234 2485 for your reservations. Here's one Japanese restaurant that serves eat all you can for a very affordable price of PhP 299. Nagomi is located at 68 Don Gil Garcia Street, Capitol Site, Cebu City. They can be reached through telephone number +63 32 319 0078. Italian food lovers rejoice! New York Pizza Depot at APM Centrale serves an all-you-can-eat pizza and pasta buffet. The location is right across SM City Cebu at the North Reclamation Area. Questions? Call them at +63 32 273 3890. Noh Eul Korean Restaurant at the Northgate Center in Banilad, Cebu City offers unlimited samgyeopsal. For a minimum of 20 persons, One Claypot House can serve eat all you can buffet meals for as low as PHP 250 per person. One Claypot House is a Singaporean and Thai diner situated at Mariepaz Suites, 18 Rosal Street corner Molave Street, Kamputhaw, Cebu City. For reservations and inquiries, dial +63 922 214 7993 or +63 908 279 1498. Unlimited chicken wings at The Gallery in Mabolo, Cebu City. Their mission is to serve the best chicken wings in the Philippines. Follow them on Facebook: Paku by Chef Binux. 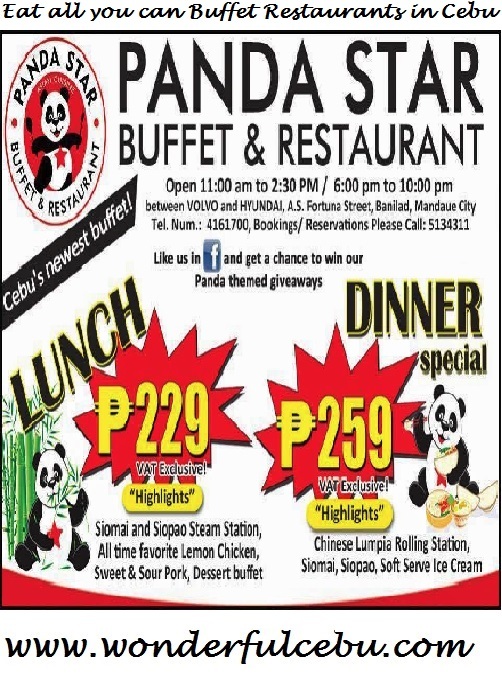 Panda Star Buffet and Restaurant along A.S. Fortuna Street, Banilad, Mandaue City offers lunch buffet at PHP 229 and dinner buffet at PHP 259. Not the best out there. You can send them email at panda_1128@yahoo.com or call them at +63 32 513 4311. Cebu White Sands Resort and Spa's Day Tour Escapade on Saturdays and Sundays comes with an eat all you can lunch buffet at Patio Gavino Restaurant. Lunch buffet is also served on legal holidays. It is priced at PHP 950 per person. Cebu White Sands Resort and Spa is at Maribago Beach, Mactan Island, Lapulapu City. Reservations may be made directly at the resort through telephone numbers +63 32 268 9000 and +63 32 495 2226 or through their Cebu City Office through Telephone number +63 32 233 7893. Patio Isabel serves eat all you can in Cebu. It is located at J. Panis Street, Banilad, Cebu City. Call +63 32 231 9510 for reservations. Pino Inasal and Kalderohan at the second level of Gaisano Fiesta Mall in Tabunok, Talisay City offers a Feast All You Can Lunch and Dinner Buffet for PHP 259 with bottomless iced tea. 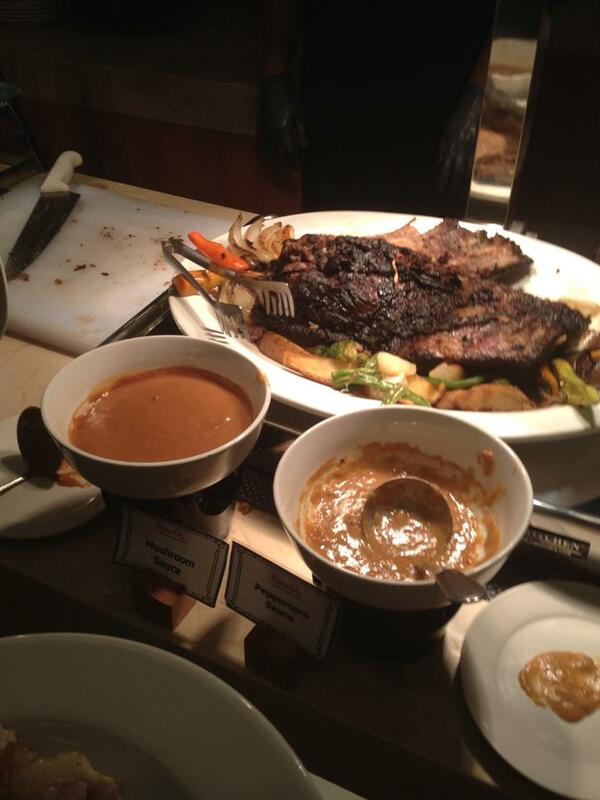 Lunch buffet is from 11:00 a.m. to 2:00 p.m. Dinner buffet is served between 5:00 p.m. and 8:00 p.m. Contact +63 32 520 1641 for queries and reservations. Closed as of 7 October 2015. Pino Restaurant Lahug Branch along Wilson Street serves lunch buffet between 11:00 a.m. and 2:00 p.m. Price is pegged at PHP 299 with bottomless iced tea. They also serve dinner buffet at PHP 399 with lechon baboy and bottomless iced tea. For reservations, call +63 32 232 0939. Pino Restaurant Express Grill Talamban at the WC Commercial Complex, Minoza Street, Talamban, Cebu City also serves lunch buffet between 10:45 a.m. and 2:30 p.m. Cost is at PHP 220 with 1 round of iced tea. For inquiries and reservations, call +63 32 346 1619. Enjoy daily breakfast buffet at Platters Restaurant in Cebu Holiday Plaza Hotel. Punch in +63 32 254 9880 on your phone dials to reserve a seat. Poilitics Resto Bar at Escario Central Mall now serves eat all you can in Cebu every Thursday and Friday noon. The buffet price is PHP 288 which includes bottomless iced tea. Dial +63 32 236 6572 for reservations and inquiries. Have a "Taste of Heaven" buffet on weekend nights at Prince Fusion Gourmet at Golden Prince Hotel and Suites' Lé Mon Restaurant at Acacia Street corner Arhcbishop Reyes Avenue, Kamputhaw, Cebu City. A stone's throw away from the Ayala Center Cebu, prices start at PHP 385 per person and the Le Mon Restaurant all-day buffet is open from 6:30 to 10:00 p.m. For reservations, call +63 32 2338660 or +63 32 4128660. 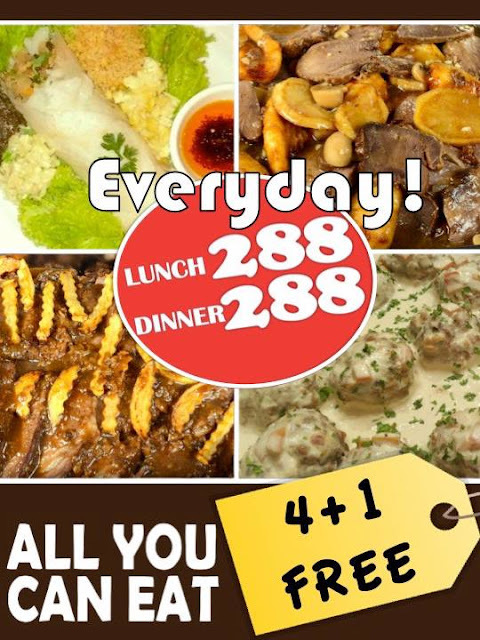 Lé Mon now offers eat all you can in Cebu all day. 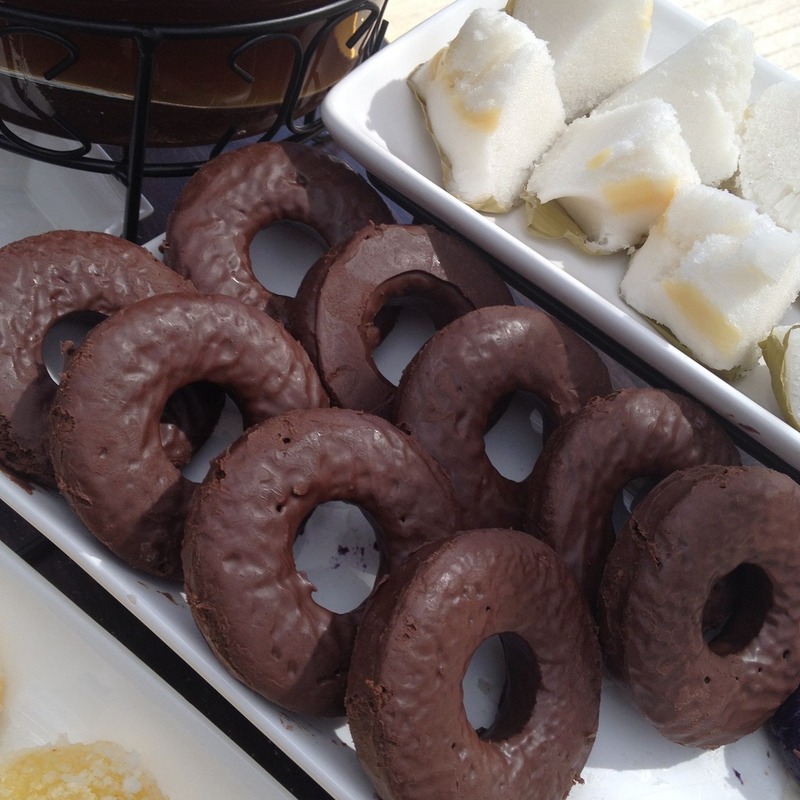 Purple Craves Cafe serves an eat all you can dessert buffet every Saturday from 3 p.m. to 9 p.m. at a very affordable cost of only PhP 143 and it already comes with bottomless iced tea. Purple Craves Cafe is located at the ground floor of the Cebu Century Plaza Hotel in Cebu City. Quest Hotel's Pusó Bistro and Restaurant is located along Archbishop Reyes Avenue across Ayala Center Cebu. International buffet dinner is priced at PHP 650 per person. For inquiries and reservations, call +63 32 402 5999. Rock 'N Pizza is located at Unit 4, Nasipit Commercial Plaza, Governor M. Cuenco Avenue, Talamban, Cebu City. They may be reached at +63 32 318 8802 or +63 917 670 1340. You can also check out the Rock 'N Pizza website or email them at rocknpizzacebu@gmail.com. Among the more popular places that offer eat all you can in Cebu is the Royal Concourse along Gorordo Avenue in Cebu City. Telephone number is +63 32 231 1045 and +63 32 231 0147.
International lunch and dinner buffet is served at Saffron Cafe in Crimson Resort and Spa, Mactan Island, You may call them at +63 32 239 3900. Simply J's Cafe and Restaurant at 10 Apitong Street, barangay Kamputhaw serves eat all you can in Cebu on Tuesdays, Thursdays, and Saturdays. Cost is at PhP 299 per person. Dial them at +63 32 505 8315. Sparkz Restobar is in Crown Regency Hotel along Osmena Boulevard, Cebu City. They offer the Sky Fiestaventure Dinner Buffet at PHP 1,000 per person inclusive of one glass of iced tea and one adventure ride or 6D movie. This offer is available daily from 6:00 p.m. to 10:00 p.m. Contact number is +63 32 418 8888 or +63 32 418 7777. Sugbufe, a Filipino buffet restaurant, is located at M. Logarta St., Subangdaku, Mandaue City. Open Mondays to Saturdays, buffet hours are 11 a.m. to 2 p.m. for lunch, 2:30 p.m. to 5 p.m. for merienda cena, and 6 p.m. to 10 p.m. for dinner. 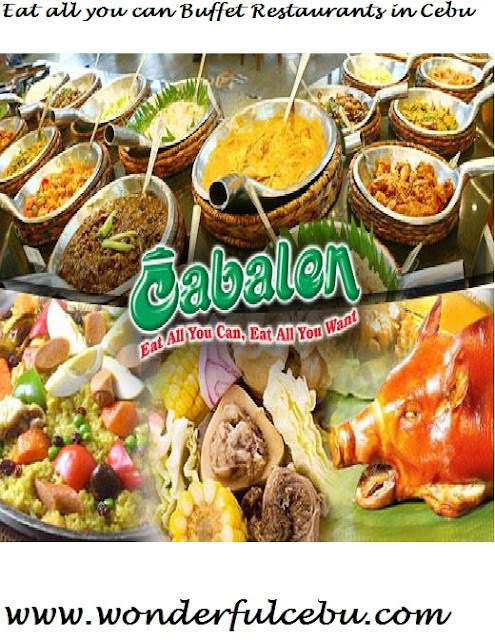 Prices are PhP 348 for lunch buffet, PhP 210 for merienda cena, and PhP 449 for dinner buffet. Tajimaya Yakiniku Charcoal Grill at Crossroads Mall, Banilad, Cebu City offer promos for eat all you can in Cebu. +63 32 232 0533 is the number to dial for inquiries and reservations. Tatang's Extra Crispy Boneless Lechon in Lahug offers boneless lechon and lechon flakes buffet lunch (10 AM to 1 PM) and dinner (6 PM to 9 PM) on Mondays at PHP 199 per person plus PHP 20 for unlimited rice or PHP 30 for unlimited puso. For inquiries ring in +63 32 316 4719 or +63 916 226 9946 or +63 32 406 3873. Head on to Tatang's Boneless Lechon at Wilson Street, Lahug, Cebu City. Villa breakfast buffet is served at Tempo in Crimson Resort and Spa, Mactan Island. Enter +63 32 239 3900 for reservations. The Dining Room at Castle Peak Hotel at F. Cabahug corner President Quezon Streets, Villa Aurora, Mabolo, Cebu City serves a daily breakfast buffet. It also serves a dinner buffet on Thursdays, Fridays, and Saturdays priced at PhP 379 per person. For reservations, call +63 32 233 1811 or fax +63 32 232 6838. Executive lunch is served daily at Diamond Suites and Residences' Grain Restaurant at a net cost of PHP 308 per person. This offer is available 11:30 a.m. to 2:00 p.m. They also offer a barbecue buffet for PHP 388 on Saturdays. Recently they launched their weekend Asian Fusion buffet price at PhP 408 per person. Diamond Suites and Residences is a stone's throw away from Ayala Center Cebu at 8 Apitong Corner Escario Street, Kamputhaw, Cebu City. Call +63 32 402 9800 for inquiries and reservations. 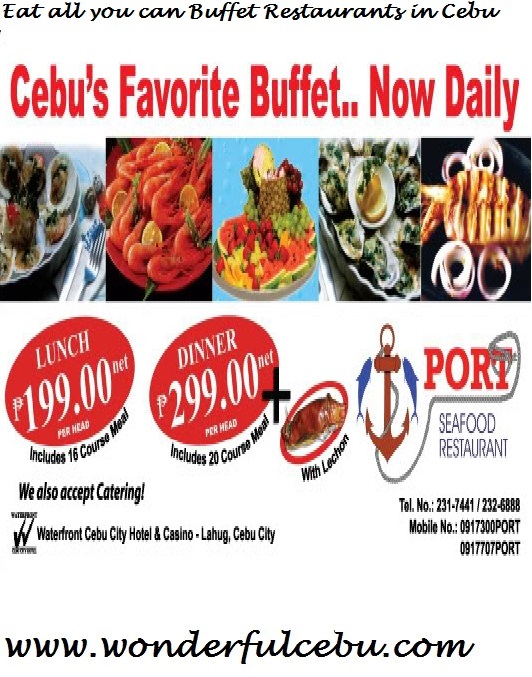 The Port Restaurant is located at the Waterfront Cebu City Hotel. Lunch buffet is PHP 279 per person, dinner buffet is PHP 370 per person, and midnight buffet or late dinner is PHP 189 per person. Drinks are sold separately. One of Cebu's pioneer buffet restaurants. People still flock here despite the many other choices in the metro. For reservations, call +63 32 231 7741, +63 32 516 6018, +63 917 707 7678, +63 922 803 3159. The Sails at Movenpick Hotel in Punta Engano, Lapulapu City serves breakfast buffet. Call +63 32 492 7777 for reservations. Affordable buffet-style lunch is available at The Villa Filipino Restaurant. Pegged at only PHP 139 per person, it is probably the cheapest buffet-style meal available in Cebu City. The Villa is located at at General Maxilom Avenue beside Sampaguita Suites and across Robinson's Fuente. A Japanese eat all you can in Cebu is available at The Yaki House along A.S. Fortuna Street, El Dorado Subdivision, Banilad, Cebu City. Lunch served between 11:00 a.m. to 2:00 p.m. costs PHP 359 while dinner serving between 6:00 to 10:00 p.m. is pegged at PHP 399. Tides Restaurant at Shangri-la Resort & Spa in Mactan Island serves eat all you can in Cebu. Buffet meals for breakfast, lunch, and dinner are available. They also currently have a wine buffet promo for an additional PHP 600 for Tides patrons. Contact number is +63 32 231 8224. A Japanese restaurant that offers eat all you can in Cebu is Tokyo Table. Tokyo Table is located at City Times Square near Parkmall at the North Reclamation Area, Mandaue City. Lunch from Mondays to Fridays cost PHP 616.00 per person. For dinner from Mondays to Thursdays, price is PHP 728.00, while meals from dinner on Fridays to dinner on Sundays and special holidays and occasions will cost PHP 840. While not really cheap, this is one of my favorites. For reservations and inquiries, call +63 32 239 7000. Tongs Seafood Buffet Restaurant serves eat all you can in Cebu. Lunch and dinner buffet meals are priced at PHP 275 and PHP 299 per person respectively. It is located at F. Cabahug Street, Mabolo, Cebu City right across Sarrosa International Hotel. You may call them at +63 32 233 7858. Also like their Facebook page. Tsim Sha Tsui in Ayala Center Cebu serves weekend lunch and dinner train buffet wherein dishes are placed on a conveyor belt that makes its rounds on the dining bar. For inquiries & reservations, call +63 32 238 9209. E-mails may be sent to vikingssmcebu@yahoo.com and one may visit the Vikings Philippines Website. Wakamatsu Yakiniku is a Japanese restaurant that serves eat all you can in Cebu. 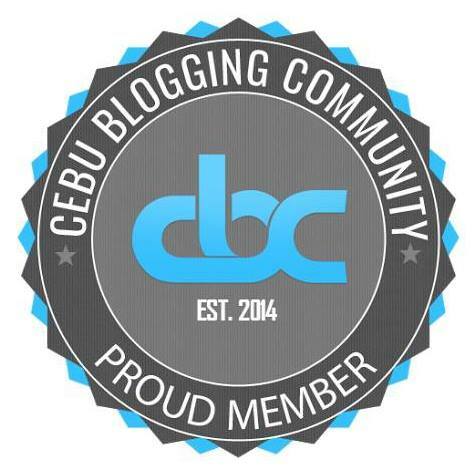 It is located at Unit 1-K, Ground Floor, Pacific Square Building, F. Cabahug Street, Mabolo, Cebu City. For reservations and inquiries, call or text +63 918 967 9941 or call +63 32 232 5897. Wang Shan Lo at the 20th floor of Crown Regency Tower 2 along Osmena Boulevard offers lunch buffet at PHP 400 and dinner buffet at PHP 450. Wasted Chef Restaurant offers eat all you can in Cebu. They have unlimited shawarma, pita burgers, pizza, and pasta from 6 p.m. to 10 p.m. daily for only PhP 250. It is right across the Asilo de la Milagrosa parish church along Gorordo Avenue, barangay Kamputhaw, Cebu City. Yakimix boasts that it is the biggest restaurant that serves eat all you can in Cebu. They offer some 200 dishes for lunch and dinner. Yakimix Sushi and Smokeless Grill Restaurant, along Escario Avenue in Cebu City offers lunch and dinner buffet starting at PHP 499 per person. Although not really that bad, they hyped this too much that I it fell below my expectations. It's not an eat all you can that they serve here but a beer buffet every Friday at PHP 268 per person (for every 2 hours). Or for PHP 300, it's unlimited beer, free pool use, and a music DJ at the pool deck of Diamond Suites. This joint is located at Diamond Suites and Residences along Tojong Street, Kamputhaw, Cebu City. Call +63 32 402 9800 for inquiries and reservations. Do you know of any other places that serve eat all you can in Cebu that have not been listed here? Do let us know and we'll be happy to add them to this list. Sucha helpful list. My friends and I are fond of all-you-can-eat buffet! Thanks for putting this together. This will really come in handy! Book marking for future reference! Thanks! Quite a long list! I didn't know some of these offer eat-all-you-can buffet. Thank you! Vikings and Yakimix soon to open... YAY! Nag open na ang Vikings sa SM? You are most welcome! Your friend will be spoiled for choices in Cebu. thank you for such helpful list ....... i got a headache goggling each resto that i can think of - but now you can find them all in one place. its terrific. it a pity youre not able to put prices on some of the eateries. but no worries - there pleny to choose from without breaking the bank. Good to know this had been good help to you.. This has been a very helpful list. Knowing that there are still a lot of affordable buffet meals in Cebu. Great one. Thanks. Happy to know this has been of help to you @Angelfire. Thank you so much. This is the most informative and helpful list I have come across so far. Thank you sa pag research nito. I love eat-all-you-can places! I'm happy you find this helpful. Am interested with Harolds butfet dinner, are the foods great? Planning to have a birthday celebration for my 14 years old daughter this coming Thursday. Hi Cely! I liked the food at Harold's when I ate there, particularly their boneless lechon and roast beef. They had a good selection of pasta too. From what I know, the theme varies daily. We ate there on pasta and carvery night. Want to know list of Restaurants in metro cities. Also Explore your nightlife in the best way. Open na po ang vikings sa sm..
Hi its been a while since i have seen panda star open. Would you be able to confirm that for me please? This is such a life saver!!!! Bless you!